Our future IS our youth. Never has a statement been more true then in the here and now. Not only does our club need our youth, but the survival of our breed depends on the hard work, dedication, and continued interest they show. ​As a club we are here to support them and help them grow to become the leaders of tomorrow. Bella has raised Blanc de Hotots for 5 years. Currently she raises Blanc de Hotots, Havanas, New Zealands, and Satins. She has been a member of 4-H for 6 years and is currently the club president of her rabbit and cavy club. 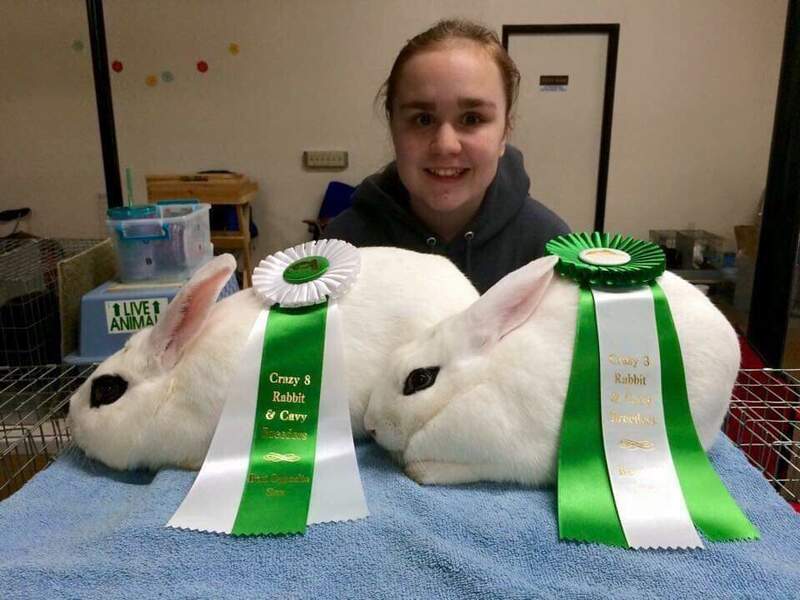 On top of that she is a member of the Washington State Rabbit Breeders Association, the ARBA, and many local and national clubs. ​Ella is a passionate 4-H member as well as an avid breeder of the Blanc de Hotot. She has been raising the Blanc de Hotot for 4 years now and has been a member of her local 4-H group for 8 years! ​Judy and Faith have been raising Blancs for over a year. They are both active members of their local 4-H group as well as the ARBA. Second picture: Faith and Judy and one of their Blanc de Hotots. The 4 M's are active members of the rabbit community. While all four of them raise Blanc de Hotots, they also have interests in other breeds. Mia and Mikayla raise Silver Martens and Mini Satins, Maggie raises Satin Angoras, while Max raises Dwarf Hotot! These four HRBI youth have been raising Blanc de Hotots for 4 years. Mikayla Veale with two of her Blanc de Hotots and their fair ribbons! Tazanna recieved her first pair of Hotots for her birthday in December 2018! She is excited to help preserve this rare breed as her mother helps preserve another rare breed, Giant Chinchillas! This will be her first breed and her first year raising Hotots. Way to go Tazanna!! !